In order to counter the threat of falsified medicines entering the legal supply chain, the European Parliament and Council have released a Directive on Falsified Medicines (2011/62/EU) (amending Directive 2001/83/EC). 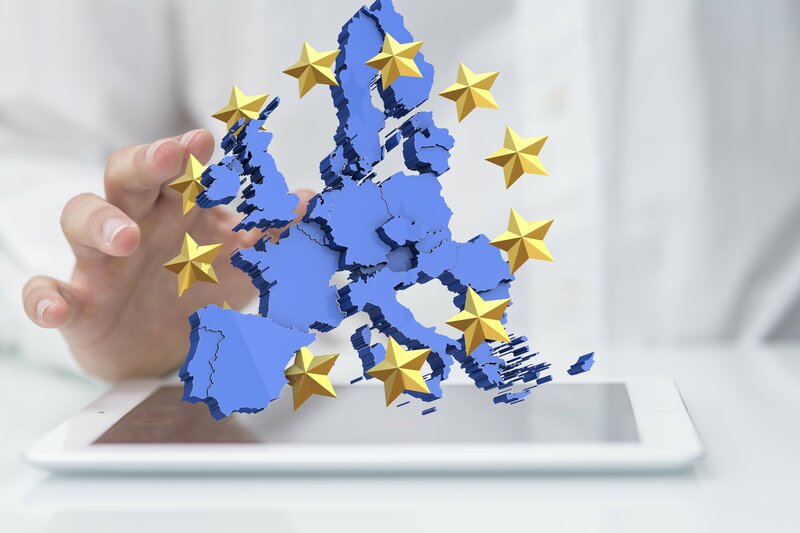 It aims at improving patient safety by mandating the Marketing Authorisation Holders and manufacturers to put a system in place that is preventing falsified medicines from entering the legal supply chain, the European Medicines Verification System. 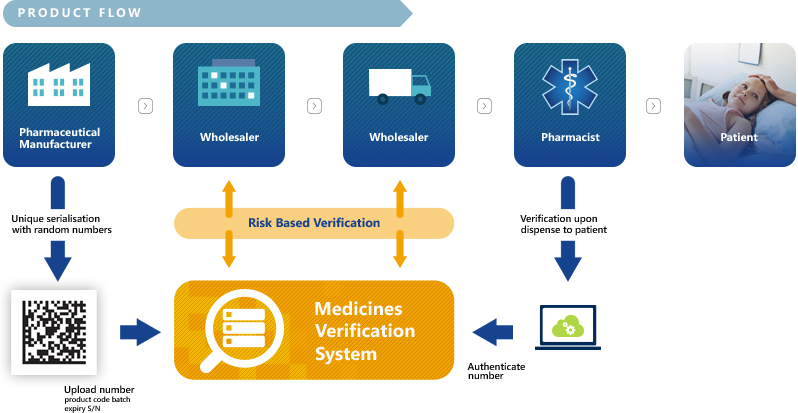 The European Medicines Verification System (EMVS) should guarantee medicines authenticity by an end-to-end verification. In essence, manufacturers will be required to print a Data Matrix code, which incorporates a unique identifier (UI) and apply an anti-tampering device on the outer packaging of all medicines for each individual sales package. At the point of dispense the medicine will be scanned, checked and verified for authenticity against a national (or supranational) repository. If the UI on the pack matches the information in the repository, the pack is decommissioned and supplied to the patient. Otherwise, if there is a warning related to this pack, then the system will highlight this as an exceptional event and the package will not be supplied to the patient. An investigation needs to determine whether the pack has been falsified or not. "Each European country has to implement a National Medicines Verification System"
With reference to the Delegated Regulation (EU) 2016/161 in its Art. 32, the European Commission states which structure the repositories system should adopt. Thus, it shall be composed of a central information and data router (the European Hub) and repositories which serve the territory of one or multiple Member States. Those repositories will all have to be connected to the EU-Hub. 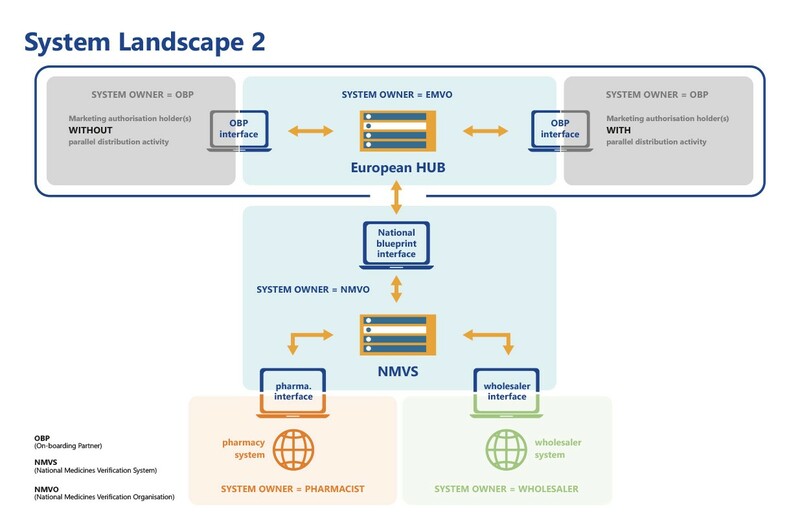 Therefore, each European country (of the European Union, the European Economic Area and Switzerland) has to implement a National Medicines Verification System (NMVS) which will be set up and managed by a National Medicines Verification Organisation (NMVO). 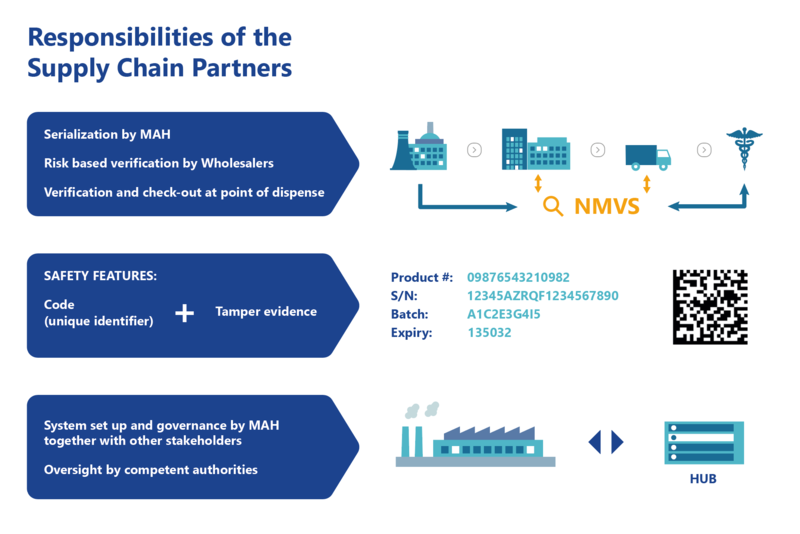 The main purpose of the NMVS is to serve as the verification platforms that pharmacies or other registered parties – such as wholesalers, self-dispensing doctors or hospital pharmacies – will use to check the authenticity of a product. • Holding the relevant product serialization data for the national market. • Receiving revised/new product serialization data from the EU-Hub. • Serving as the verification platform for pharmacies or other registered parties such as wholesalers and hospitals to certify the authenticity of a product. • Serving as the platform for wholesalers in the case of member states application of Art. 23 DR, to mark a product pack as decommissioned prior to handing it over the patient. 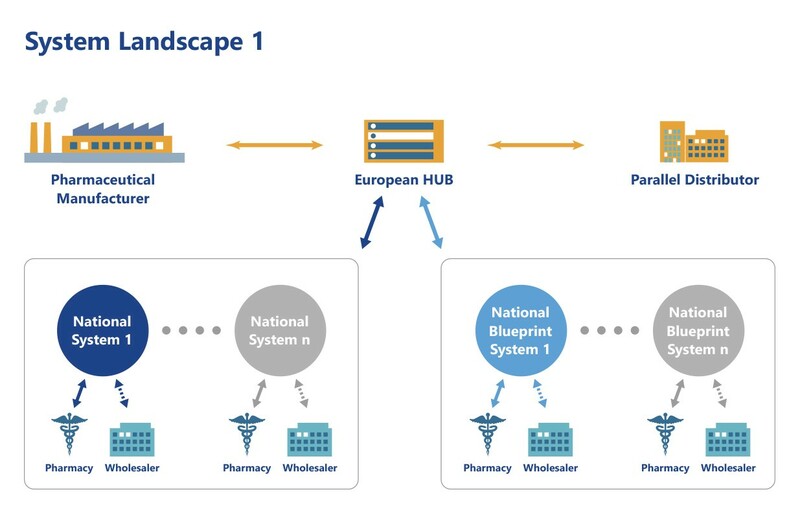 In order to implement the European Medicines Verification System (EMVS), all National Medicines Verification Systems (NMVS) needed to be connected to the EU Hub prior to the start of the Operational Phase on 9th February 2019. Several formalities had to be taken into account; including a system assessment, quality assurance goals and technical requirements. Prior to the start of the Operational Phase of the EMVS, all NMVOs were On-Boarded to the EMVS. To have achieved this was a remarkable achievement, and was due to the hard work of the EMVO secretariat and each NMVO. EMVO and the NMVOs remain committed cooperating on an ongoing basis, and regularly meet in Brussels to share knowledge, experience and ideas. In addition to signing the mandatory Participation Agreement (PA) with EMVO, On-boarding Partners / Marketing Authorisation Holders are requested to conclude a contract at national level and pay an annual fee. The applicable fee model depends on each NMVO. Therefore, please consult the latest version of the NMVO Fee Models Overview Presentation and the NMVO Fee Models Overview Table to identify the applicable fees. In case you would need further details, please take direct contact with the relevant NMVO(s).